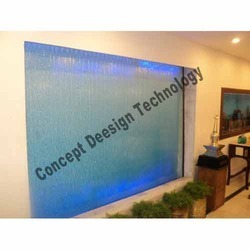 Our product range includes a wide range of glass water fall and glass water curtain. Concept Design water curtain fountain systems represent an interesting design element in fountain technology. As the water is running noiselessly and without spraying downwards along the special water curtains, many possible applications are offered. Indoors the water curtain fountain can divide a room or form a glittering curtain and provides a suitable room climate. Concept Design water curtain fountains basically consist of a bottom water reservoir and a water distribution system with a multitude of water curtain nozzles and the corresponding number of adjustable transparent water curtains. The water reservoir comprises the complete technology - such as pump, overflow drain, freshwater refill, power supply, the water curtain conduction plate and the underwater lights. 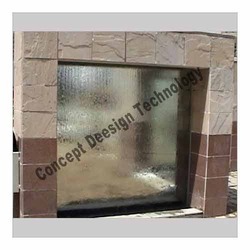 These Glass water curtains can be installed indoor as well as in outdoor applications as shown. Concept Design water curtain fountains basically consist of a bottom water reservoir and a water distribution system with a multitude of water curtain nozzles and the corresponding number of adjustable transparent water curtains. The water reservoir comprises the complete technology - such as pump, overflow drain, freshwater refill, power supply, the water curtain conduction plate and the underwater lights. Concept Design accessory program also offers other components like a water treatment with the installation of water softener, filtering and dosing plant. Looking for Water Curtain Fountains ?